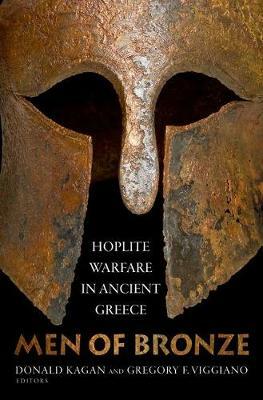 Men of Bronze takes up one of the most important and fiercely debated subjects in ancient history and classics: how did archaic Greek hoplites fight, and what role, if any, did hoplite warfare play in shaping the Greek polis? In the nineteenth century, George Grote argued that the phalanx battle formation of the hoplite farmer citizen-soldier was the driving force behind a revolution in Greek social, political, and cultural institutions. Throughout the twentieth century scholars developed and refined this grand hoplite narrative with the help of archaeology. But over the past thirty years scholars have criticized nearly every major tenet of this orthodoxy. Indeed, the revisionists have persuaded many specialists that the evidence demands a new interpretation of the hoplite narrative and a rewriting of early Greek history. Men of Bronze gathers leading scholars to advance the current debate and bring it to a broader audience of ancient historians, classicists, archaeologists, and general readers. After explaining the historical context and significance of the hoplite question, the book assesses and pushes forward the debate over the traditional hoplite narrative and demonstrates why it is at a crucial turning point. Instead of reaching a consensus, the contributors have sharpened their differences, providing new evidence, explanations, and theories about the origin, nature, strategy, and tactics of the hoplite phalanx and its effect on Greek culture and the rise of the polis. The contributors include Paul Cartledge, Lin Foxhall, John Hale, Victor Davis Hanson, Donald Kagan, Peter Krentz, Kurt Raaflaub, Adam Schwartz, Anthony Snodgrass, Hans van Wees, and Gregory Viggiano.